A game by Inti Creates and ArtPlay for PC, PS4, Vita, Switch, 3DS, and Xbox One, originally released in 2018. There’s no arguing that Castlevania has left a lasting mark on the gaming landscape. The series introduced players to gothic environments filled with classic monsters, the regularly-resurrected Dracula as its main villain, and a lineage of whip-wielding heroes with stiff jumps to push back evil for another 100 years (assuming Drac could ever stay down for that long). 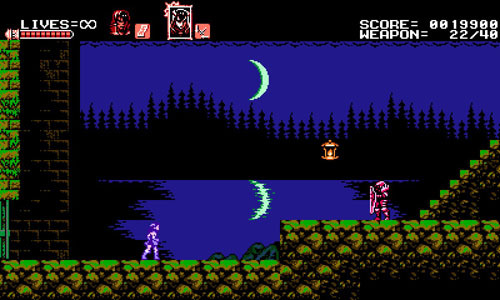 The series continued to break its own rules by introducing light RPG elements in its second outing, followed by a prequel that offered multiple playable characters, and then a revisitation of the original story of Simon Belmont that introduced new gameplay mechanics… and that’s all before the series went on to establish the basics of the now-well-trodden metroidvania subgenre. 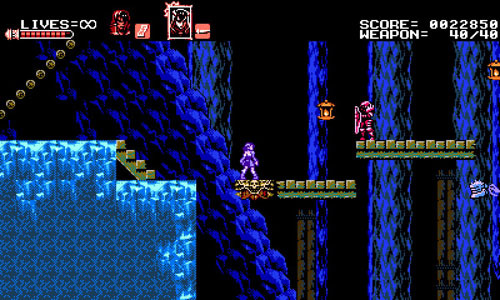 While there are innumerable games that have pulled their influences from the metroidvania era of Castlevania, far fewer have drawn inspirations from the early games in the series. 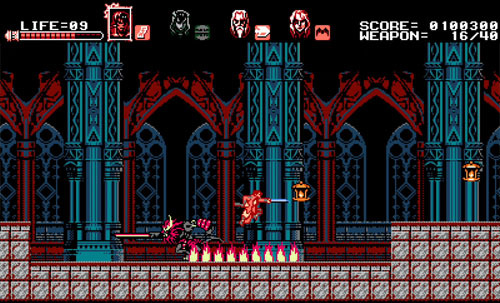 Bloodstained: Curse of the Moon is one such game, delivering an experience that is so close to the early Castlevania games – Castlevania III in particular – that a few sprite swaps would make it impossible to separate it from the real thing; it looks and plays like a modern update to the classic series. In fact, Castlevania series veteran Koji Igarashi is the game’s producer. Igarashi formerly worked for Konami where he acted as producer on numerous Castlevania games (of the metroidvania era), and he played a substantial role in the development of the now-iconic Castlevania: Symphony of the Night. The game also features music by longtime Castlevania composer Michiru Yamane, among other artists. At the start of the game, the player takes control of Zangetsu, a demon-slaying swordsman with a strong dislike for demonic magic and the people who use it. Zangetsu has a 1.5x nonvariable jump and no midair direction control, just like his spiritual ancestors in the Belmont clan. His sword has a short range and can be used to kill enemies or break floating lanterns, which drop health-restoring hearts, bags of money, or mana-restoring potion bottles. 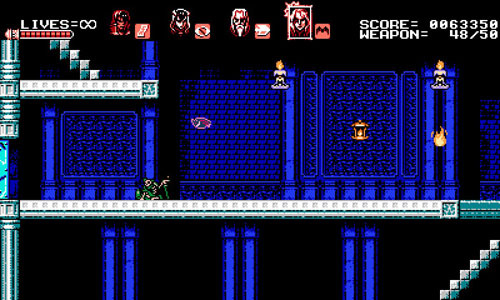 Blue lanterns contain sub-weapons, replacing whatever sub-weapon the player has equipped at the time, and each use of these weapons draws mana from a weapon meter in the upper right corner of the screen. There are also a few destructible walls that reveal money or large health restoratives. 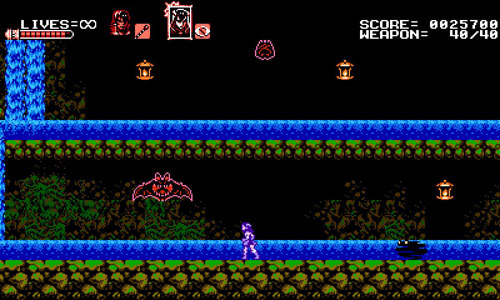 Money adds to the player's score, as does any unused mana at the end of the level, but the score does not appear to serve a gameplay function. Zangetsu begins the game with a medium-range melee sub-weapon that allows him to attack diagonally upward, which is great for fighting flying enemies or reaching out-of-the-way lanterns. Another sub-weapon comes in the form of a purple ball of energy that Zangetsu throws downward at an angle and which remains onscreen for several seconds (but only one onscreen at a time). This purple orb causes continuous damage to any enemies it is touching, operating similarly to holy water in the Castlevania series. Finally, there is a flame powerup that temporarily grants Zangetsu incredible strength, letting him take down powerful enemies quickly and making short work of bosses, provided he can get in close enough to attack. Along his journey, Zangetsu encounters three additional characters: Miriam, Alfred, and Gebel. Zangetsu makes it clear that he is not pleased with the notion of partnering up with them, due to his intolerance of demonic magic, but he can choose to let them join him rather than killing them, as their skills may aid him in his quest. 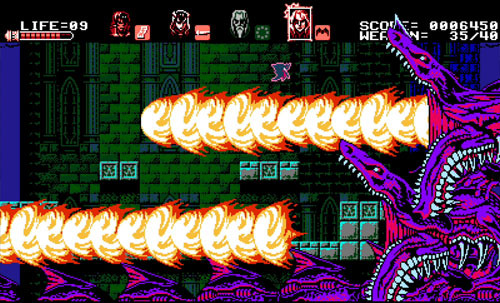 These characters appear after each of the first three bosses is defeated, and once these characters join the party, the player is free to swap between them at will. Each character has his or her own life bar, and each has unique movement abilities and sub-weapons. Swapping characters is the crux of the game, for a number of reasons. First off, the new characters offer the player a number of different playstyles to choose from. Secondly, if one character is low on health, the player can swap over to another, and eventually find restoratives to heal the injured character. Thirdly, certain characters are more equipped to deal with specific enemy types and bosses. 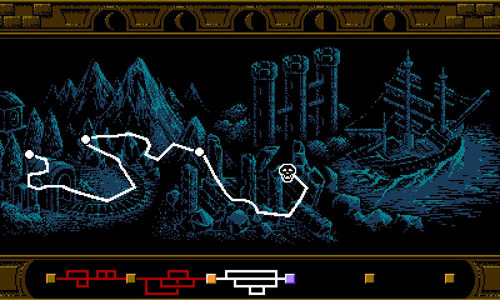 Finally, and most importantly, the game features numerous branching paths, and often a specific character’s abilities must be used to access these paths. There are a number of rewards granted for exploration, including permanent health and mana increases, increased damage resistance, and increased attack strength. Players can also enter a menu and access the “Curse of the Moon” option to permanently reset their progress and revisit previous levels to travel down alternate paths and seek out these stat boosts. Miriam is the first character unlocked, and she is far more mobile than Zangetsu. She has a 2x variable jump and a ground slide that lets her pass through narrow passages. Her weapon is a whip that not only has a much longer range than Zangetsu’s sword; it also stays onscreen a bit longer, making it easier for her to damage enemies and absorb incoming projectiles. Miriam’s default sub-weapon is a dagger that flies in a straight line across the screen, and she can also pick up a 3-way dagger that shoots upward at an angle. Another of her sub-weapons is a scythe that can be tossed in a straight line, but it returns like a boomerang, doing damage in both directions, and Miriam can toss two of these at a time. Finally, Miriam can access a heavy, slow-moving axe that delivers a powerful overhead strike. The next character who joins Zangetsu is Alfred, an aged alchemist with a very short melee attack and a smaller health bar, but he makes up for these shortcomings with powerful magic. He can cast a ring of fire around his body that makes him all but impervious, and the fireballs do weak continuous damage to any enemy they touch. A second sub-weapon allows him to create a double of himself that mimics his movement and attacks but is invincible. Another of Alfred’s sub-weapons is a huge ice spear that freezes enemies and objects alike. 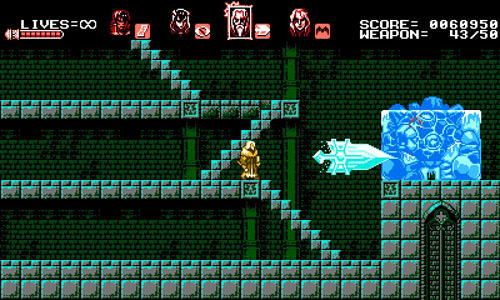 It can be used to freeze some of the toughest enemies in the game, which can then be used as platforms or shattered with a follow-up attack. Finally, Alfred can access a powerful electrical attack later in the game (dropped from green lanterns) that seeks out enemies and delivers multiple hits before disappearing, and several can be onscreen at once, reaching any enemy on the screen and automatically seeking out boss’ weak points. Finally, there is Gebel, a vampyric character who wears a cloak. His only weapon is a trio of bats that appear when he opens his cloak. They fly upwards but disappear at a short distance; however, they can be used to strike enemies on higher platforms to take them out indirectly. Unlike the other characters, Gebel cannot use any sub-weapons. In fact, when Gebel is selected, blue lanterns no longer drop sub-weapons but rather drop large mana-restoring potions, so this can be used strategically to refill the meter more quickly. Instead, Gebel can transform into a bat. This unique ability allows him to bypass difficult platforming sections and reach areas inaccessible to other characters, but he transforms back if the mana meter is depleted or if he takes damage, which means he can be killed instantly if he gets hit while flying over a bottomless pit. 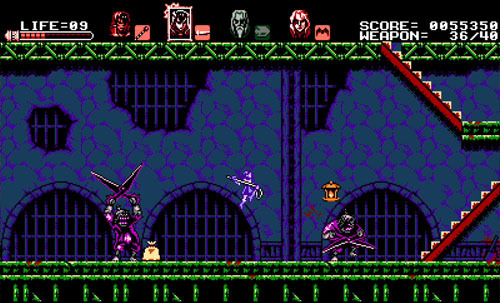 Players who enjoyed the classic Castlevania series will find obvious corollaries between these four characters and the four characters found in Castlevania III: Dracula’s Curse, down to their sprite designs, attacks, and special abilities. 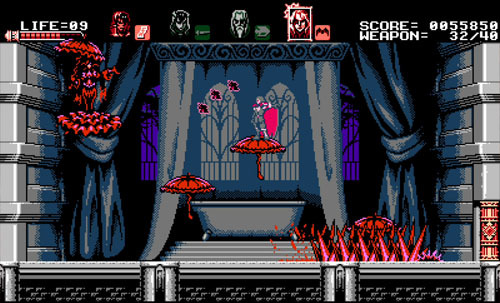 Bloodstained “cheats” a bit with the sprite colors, as the NES had 2-bit sprites that were limited to four total colors, one of which was a transparency for the background, whereas Bloodstained uses four colors in the design of the sprite itself, plus a transparent background. It’s a small change, but one additional color in such a limited palette goes a long way toward allowing for extra detail. Color depth was king in the 8- and 16-bit eras. Zangetsu plays similarly to Trevor Belmont, a character who begins his quest to vanquish evil alone, until he meets up with three companions. 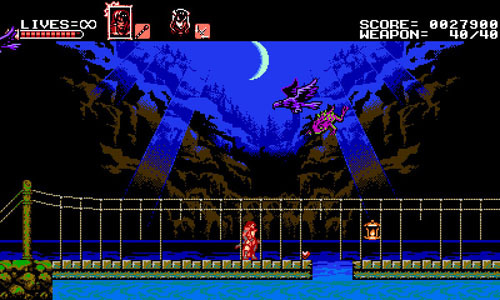 The first character Zangetsu meets is Miriam, who has higher jump and a ground slide, whereas Trevor meets up with a pirate named Grant Danasty who can climb walls, jump higher, and change directions in midair. Grant uses a dagger as his primary weapon, and a dagger is Miriam's default sub-weapon. Zangetsu then goes on to meet a robed wizard named Alfred, with powerful magic that includes a flame shield, an enemy-freezing ice spell, and a rare but powerful electrical attack, whereas Trevor meets up with Sypha Belnades, a robed wizard who has an almost identical melee attack and a wide range of spells, including a flaming projectile, the ability to freeze enemies, and a rare but powerful electrical attack. Finally, Zegetsu meets a vampyric fellow named Gebel who can turn into a bat, whereas Trevor meets Alucard (Dracula’s son) who has precisely the same ability, and running out of magic or taking damage also causes him to transform back into his dhampir self. 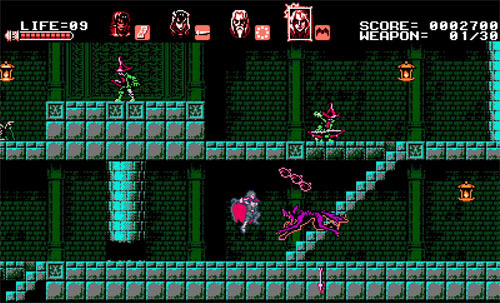 Castlevania III only allowed players to swap between Trevor and one other character, as opposed to swapping freely between all four characters. However it did offer nonlinear levels and different endings based on the companion Trevor selected at the end of the game. 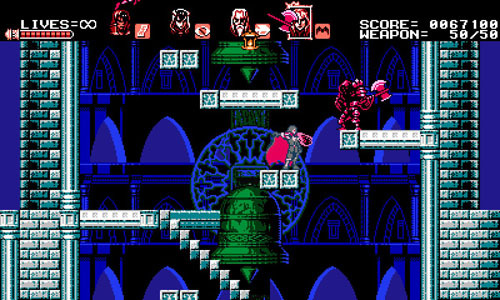 Bloodstained: Curse of the Moon also features nonlinear levels and multiple endings – and new post-game content – based on the player’s actions in the main quest. Even the font used for the text is virtually identical. 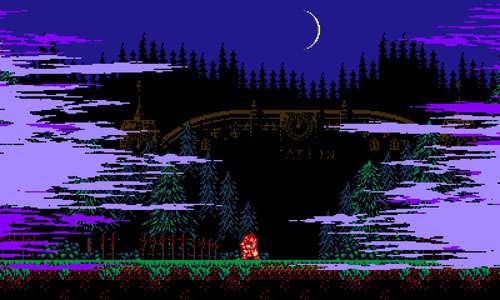 Bloodstained: Curse of the Moon offers a number of niceties over its NES antecedents, with a widescreen presentation, the lack of any flicker or slowdown, and screen-filling bosses. In addition, the game offers players the ability to play on veteran or casual difficulty modes, with the veteran difficulty offering a limited stock of lives with which to complete each area. When played in casual mode (for which there is no penalty), players have an unlimited stock of lives and are simply returned to the most recent checkpoint upon death, rather than being sent back to the start of the area after losing all lives. 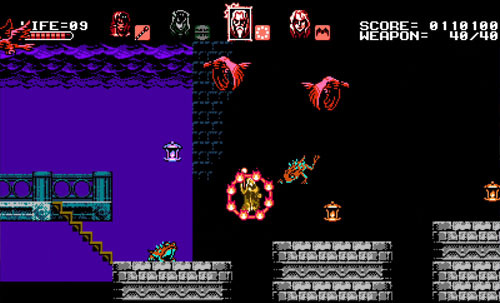 The early levels are a cakewalk in casual mode, especially given that enemies do half the damage in this mode, the player starts with more magic, and health restoratives are dropped more frequently. More importantly, in veteran mode, players are knocked back when taking damage – a staple characteristic of the early Castlevania games – but the knockback effect is removed in casual mode, making platforming sequences considerably easier, especially when bottomless pits are involved. 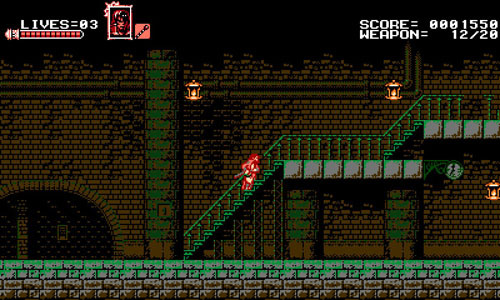 Fans of the classic Castlevania series will be right at home with the game’s opening, which features clearing fog that reveals the protagonist standing next to a wrought iron fence, as he turns to face a building in the background… but rather than Dracula's castle, the featured structure is adorned with clocks (a staple of the Castlevania series, though generally only seen in the final stages). 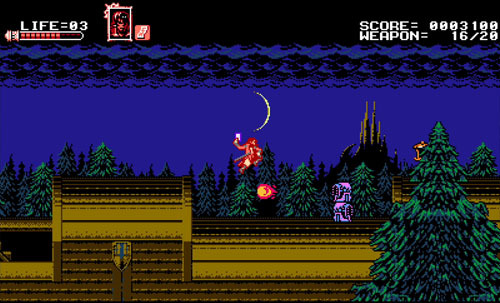 The player begins outdoors, walking through a wooded area at night while ghoulish enemies approach from the left and right, dispatched easily with a swing of the sword, and hovering lanterns drop hearts, money, or sub-weapons when struck. 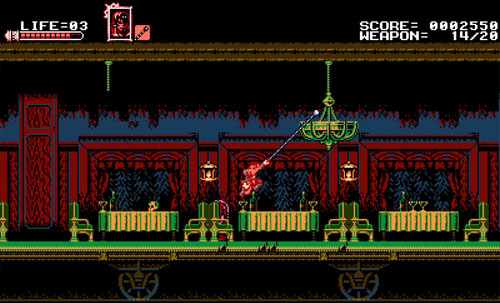 One element that sets this opening area apart is the presence of a ghostly train that passes in the background as Zangetsu approaches the clock-adorned building. 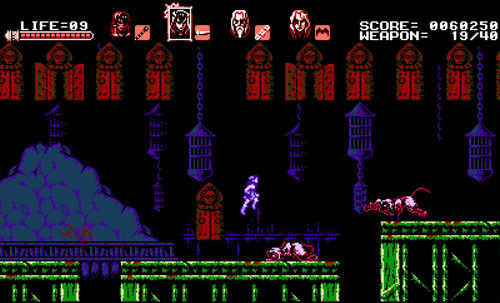 Once inside, players face more ghouls and a few rats, along with staircases and blocky designs strongly reminiscent of the NES-era Castlevania games. The player can jump onto staircases, but he cannot jump off of them. A few areas suggest branching routes, but Zangetsu does not possess the ability to access them, and he generally cannot turn around to access other branches once one is selected. 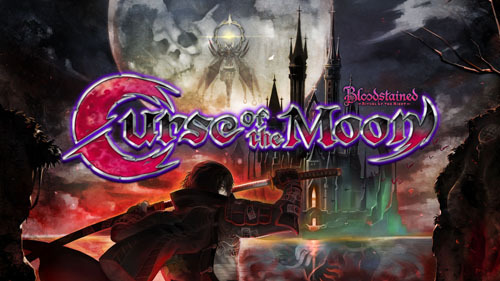 Side routes may be accessed by using the Curse of the Moon option in the menu to return to previous areas, or accessed later via other characters’ abilities while playing the post-game content. The player gains a few hints early on, such as paying attention to skeletal remains, as they point the direction forward… but once new characters are unlocked, the player is free to disregard these suggestions and travel in any direction he is able. Sometimes even the suggested route requires the use of another character’s abilities, so players may be forced to take side paths if that particular character has been killed. 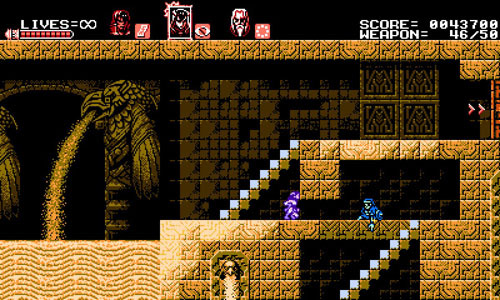 Fortunately, characters come back to life after defeating bosses, or the player may opt to kill off his remaining characters to revert back to the most recent checkpoint, although this is only recommended in casual mode where the player has infinite lives. 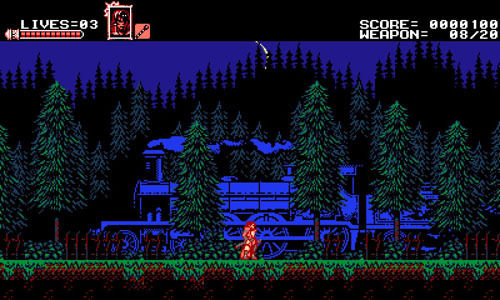 Leaving the traditional gothic architecture leads the player to a train, which begins moving when the player boards. Here, the player contends with swinging and falling chandeliers, eventually climbing onto the roof of the speeding train (as you do in video games) to reveal the dark spires of a distant structure reaching into the night sky like a great claw, and lit by a slivered moon. 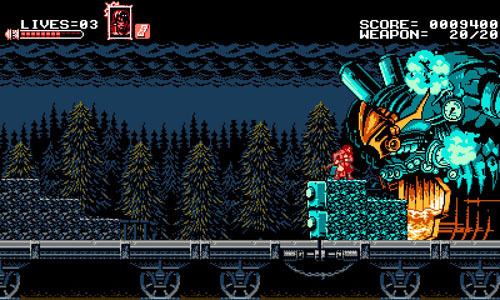 The level ends with an encounter against a visually impressive steampunk robot that feeds its furnace with heaps of coal, which you can stand on to deliver strikes against its obvious weak point. 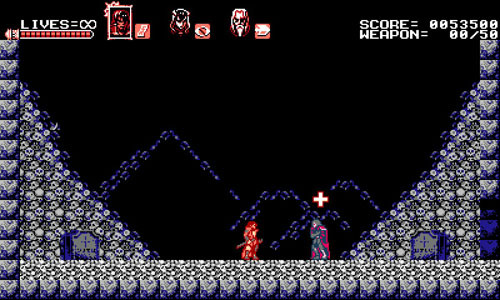 This is one of many stunning boss encounters to be found throughout the game, which help to set the overall tone of the adventure as something more than a simple recreation of an old Castlevania game. 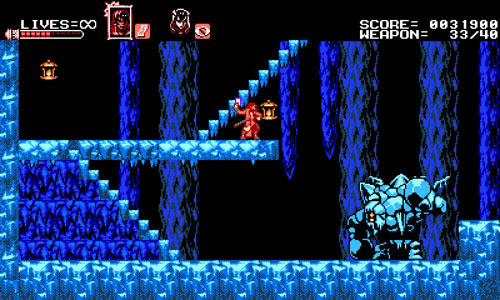 From here, the player moves into icy caves, watery jungles, sandy ruins, a dark fortress, and a haunted pirate ship while facing off against a number of enemies that act as variants to classic Castlevania foes, including bats, axe-tossing armored knights, bone pillar-like foes, and skeletal serpents attached to walls. Mixed in with these are several unique creations that feel right at home with the classic beasts. There are a few enemies that move in sine wave patterns as well, but the player’s movement speed is a bit faster and enemy sine waves are less pronounced, meaning that nothing is quite as dangerous as the dastardly medusa heads you remember from your youth. 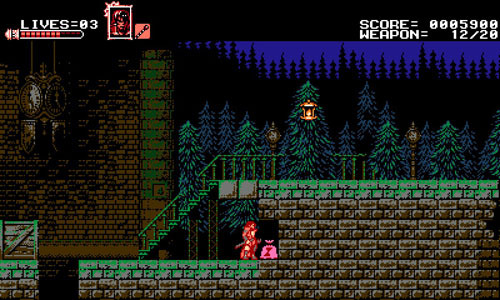 Completing the first five stages leads the player to the spired castle that was previously seen during the train sequence. Now there is a half moon, suggesting that a week has passed on Zangetsu’s journey to this point. There are new enemies and challenges to be found in the castle, along with some frustrating die-and-retry chase sequences, as well as a boss encounter against an enemy who appears to be the bloody Countess Elizabeth Báthory (complete with bathtub). 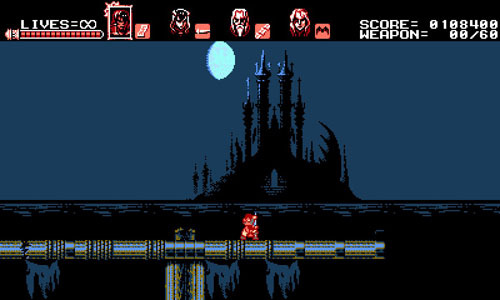 The final three stages play out on the castle grounds and within its walls, with a full moon standing over the exciting finale, concluding with one of several endings… only to reveal that there is more to be seen should the player wish to dive in again to take on nightmare mode, along with a new final stage and true final boss. Bloodstained: Curse of the Moon was developed by Koji “Iga” Igarashi in a newly-established company called ArtPlay, a Japan and China based venture, in conjunction with Inti Creates. Igarashi is best known for his work on the Castlevania series during his time at Konami before he set out on his own (around the time that Konami was abandoning traditional AAA game development and moving toward primarily mobile platforms), notably his work on Castlevania: Symphony of the Night and his oversight of most of the metroidvania-style games that followed. Castlevania series veteran composer Michiru Yamane created the music for this new game, along with, Ippo Yamada (Mega Man ZX Advent, Azure Striker Gunvolt, Demon’s Crest), Jake Kaufman (Shovel Knight, Shantae: Half-Genie Hero, Retro City Rampage), and Noisycroak. Inti Creates also developed the Azure Striker Gunvolt series, the Gal*Gun series, Mighty Gunvolt, Mighty Gunvolt Burst, Blaster Master Zero, and most of the latter day entries in the Mega Man series, including the Mega Man Zero series, Mega Man 9, Mega Man 10, Mega Man ZX, and Mega Man ZX Advent. Bloodstained: Curse of the Moon was created as part of a very successful 2015 Kickstarter project meant to fund a modern 2.5D Castlevania-inspired game entitled Bloodstained: Ritual of the Night, in which Miriam is the lead character. One of the stretch goals was a classic 2D homage to the NES-era of Castlevania games, which was offered for free to backers and as a purchasable download for anyone else. Notably, prior to this Kickstarter campaign, Keiji Inafune had left Capcom to form his own company (Comcept) and apply his Mega Man acumen to the development of Mighty No. 9, which was also launched by way of a successful Kickstarter campaign and developed in partnership with Inti Creates.